The French acquisition of Indochina reflected the great colonial competition of the 19th century. Naval officers and missionaries saw Indochina as a fated target of France's civilizing and Christianizing mission. Merchants saw it as a source of wealth and an entree to trade with south China. All saw it also in the context of the rivalry with Great Britain, which had already secured Burma and Malaya, and seemed ambitious for more. Officials in France had more important priorities than imperialism in East Asia, But Paris was lead on by the enthusiasm and enterprise of the officers on the scene. Two heroes were the gallant young naval officer Francis Garnier who first took French forces into Tonkin, and Captain Henri Riviere who followed ten years later to seize Tonkin. Both were to be killed in the act near Hanoi, but other commanders and officials completed the task. In October 1887 the Protectorates of Annam, Tonkin, and Cambodia were put under the Minister of Marine and Colonies and were brought together in an Indochinese Union -- thus French Indochina -- under a civil Governor General along with the Colony of Cochinchina and later the Protectorate of Laos and the leased territory of Kwang Chow Wan in south China. Cochinchina, taken by the French in 1859 and run by admirals until 1879, was later administered under a governor as a direct colony of France. The mandarins had left upon the French conquest and were replaced by French inspectors of native affairs. It was thus governed with less Vietnamese participation than the protectorates. The Conseil Colonial represented the moneyed interests in the colony. It was later composed of 14 French and 10 Cochinchinese elected under a restricted suffrage. Annam was ruled after 1884 as an indirect protectorate with the Emperor and the Court of Hué in place, and the French resident superior having the real power. The mandarins, however, had a significant role in local administration. There was also a Conseil du Protectorat and a Chambre Indigene Design Representants du Peuple. Tonkin, seized in 1882, was ruled after 1897 as a direct protectorate with the French resident superior taking the role of the former Annamese viceroy. The Red River Delta was under civil authority and the high country and the border areas were under military authority. The provincial mandarins had a lesser role than in Annam. There was a consultative assembly, and later three councils, two as in Annam and a third that represented French economic interests. Cambodia was governed under a resident superior as a direct protectorate, and Laos was under a resident superior with some limited authority for the King of Luang Prabang in his domains. Legislation for Indochina was largely enacted by the French National Assembly or put out in the form of decrees by the Ministry of Colonies. French took posts in Indochina at far lower levels than did Europeans in the administrative structures of the other European colonies in the Far East. The French companies and colons were powerful and tenaciously furthered their interests over those of the Vietnamese and the Metropole. They were often able to force the retreat of or even dismissal of governors general who were liberal or trying to build a more centralized administration. Despite the colon opposition Governor General Doumer succeeded in 1898 in establishing pan-Indochina policies, including general services of post and telegraphs, public works, customs and monopolies, and agriculture and commerce. A fine extensive system of roads and a never profitable trans-Indochina railways were built. Under the French education program the study of Chinese and the native Vietnamese (chữ nôm) written characters was curbed and the study of the French language assiduously pressed. But many French felt that higher education only begat revolutionaries, and university education for Vietnamese was scant. Taxes were collected assiduously by a Bureau de Douanes et Regies. Constabulary duties were carried out by a Garde civile in Cochinchina and a Garde indigene in the protectorates, the latter in the 1930's having a force of some 12,000 men formed into brigades. These forces were later called the Garde Indochinoise. 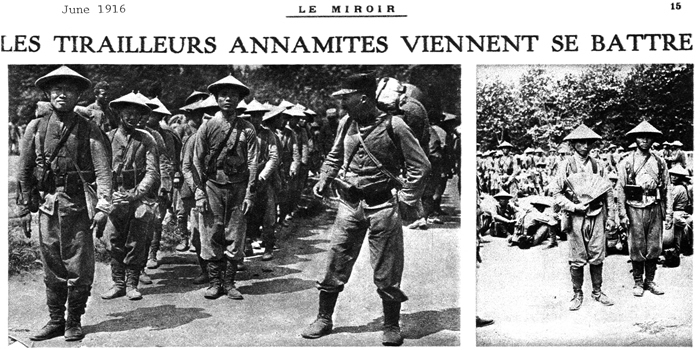 The French ideal of policy towards the natives passed from "Assimilation," whereby the Vietnamese were gradually to become "Frenchmen of Color," to "Association" whereby Vietnamese would remain in a separate, parallel, and somewhat inferior role. Some Vietnamese, particularly those not of mandarin status, saw a way to rise materially and socially by working with the colonial regime. There were also many among the Vietnamese elite, particularly Christians, who sincerely believed in the value of French civilization and modernizing reforms. 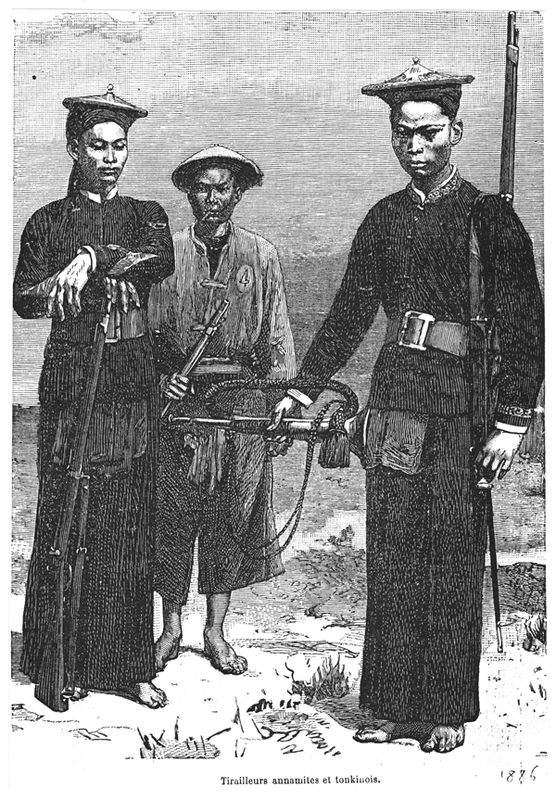 One such collaborateur notable, for instance, was Do Huu Phuong, the Prefect of Cholon, who adopted much of French culture and was awarded the Legion of Honor in 1873. The French Higher Councils for Indochina included native members in a consultative role. But the proud and nationalistic Vietnamese were to bridle under French rule. High taxes and often harsh suppression of peasant protests built a base of popular support for nationalistic movements. The first ones were monarchial, such as that of the exiled Prince Cuong De, which strove for the return of the authority of the Court of Hue. In this century the Chinese and Russian revolutions inspired new movements. Admiral Decoux under the Japanese shadow in the early 1940's tried to create an "Indochina Mystique," a nationalism tied to France, but this had no chance. In the end the most disciplined and ruthless of the revolutionaries, the communists, were to win against the French, their nationalist rivals, and the American forces.